LAUSANNE, Switzerland — The World Baseball Softball Confederation launched the first-ever world rankings for softball, across both men’s and women’s disciplines. 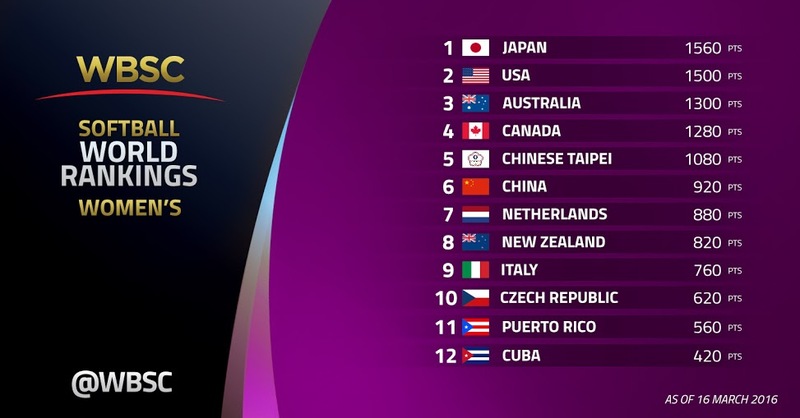 The newly implemented world ranking system tracks the performance of a country’s National Team in the Softball World Championships, including junior and top-tier levels, over a three-year period. The WBSC Softball Competitions Commission carried out the assignment of extensively reviewing, developing and introducing an initial world ranking system. This task force will continue to study the best method for the ongoing expansion of the world rankings to include multi-sport events, regional championships, head-to-heads and other WBSC-recognised international competitions in which WBSC’s 141 Members worldwide participate. Japan and New Zealand rank No. 1 in the new WBSC Softball World Rankings in women’s and men’s, respectively. Japan is now the top-ranked country across both women’s softball and men’s baseball — events that could potentially be re-introduced and generate massive nationwide interest and strengthen host nation, as well as worldwide, engagement for the Tokyo 2020 Olympic Games. Japan’s top ranking and success on the world stage comes as baseball/softball is the country’s top sport, in terms of youth participation, popularity, fan-attendance, broadcast/media coverage and existing infrastructure. Asia, the Americas, Europe and Oceania are all represented in the Women’s Top 10, highlighting a universal footprint of the sport. The Japan National Softball Team programme has secured the No. 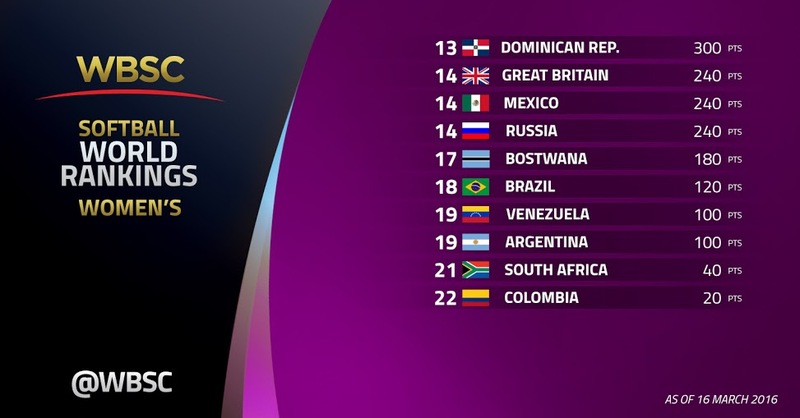 1 ranking (1560 pts), elevated by gold medals at both the 2012 and 2014 Women’s Softball World Championship. Trailing leader Japan by just 60 points is the United States (1500 pts). The U.S. Women’s National Team captured the silver medal at the world championships in 2012 and 2014, while the U.S. is the current Junior Women’s world champion. Australia (1300 pts), Oceania’s top representative, is the World No. 3. Canada is the World No. 4, with 1280 points, while Chinese Taipei, with 1080 points, is No. 5. Europe is showcased in the Top 10 by No. 7 Netherlands (880 pts) and No. 9 Italy (760 pts). No. 17 Botswana (180 pts) is Africa’s top-ranked nation on the continent. Four continental regions are featured in the Men’s Top 10, including Oceania, the Americas (North, Central, and South Americas), Asia, and Europe. New Zealand, “the Black Sox”, is the World No. 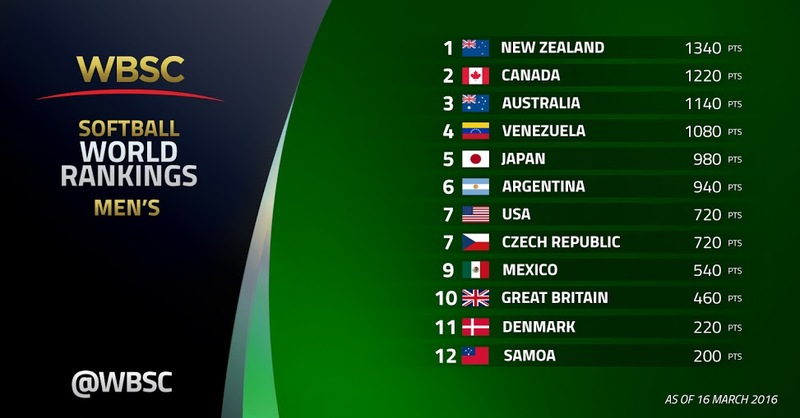 1, with 1340 points after winning the 2013 Men’s Softball World Championship and placing second at the 2014 juniors and 2015 men’s world championships. Canada (1220 pts) captured the 2015 men’s world title and is ranked No. 2, followed by No. 3 Australia (1140 pts) and No. 4 Venezuela (1080 pts). World No. 7 Czech Republic (720 pts) and No. 10 Great Britain (460 pts) place Europe firmly within the Top 10. No. 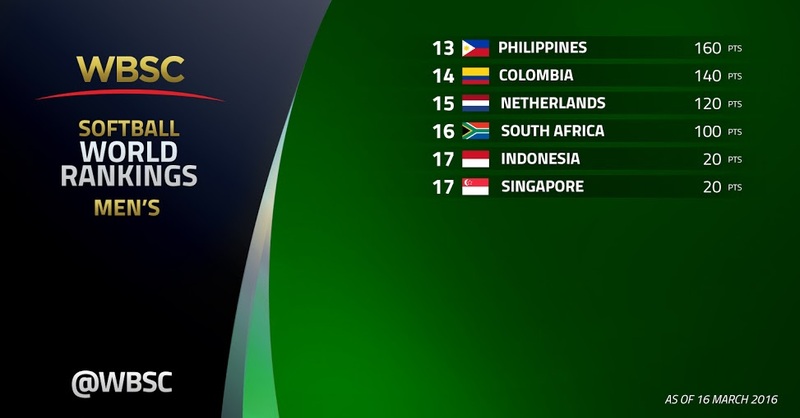 16 South Africa (100 pts) is Africa’s top representative in the world rankings. The top international softball competitions on the 2016 calendar are the Women’s World Championship in Surrey, Canada and the Junior Men’s World Championship in Midland, USA in July. Overall ranking will be by gender, based on 80% of the overall Senior World Championship ranking and 20% of the Junior ranking. In order to operationalise these parameters, the format will allocate points directly by finish. The first place team at an event is given the number of points equal to the number of teams in the World Championships, to a maximum of 16 points and multiplied by 100. (i.e. only reward down to a 16th place finish). So in the case of an event with 16, or more teams, the first place team gets 16 points *100, second place 15* 100 points all the way down to sixteenth place which receives 1 point. In the case of an event with less than 16 teams, the maximum # of points available is equal to the number of team competing. Senior Ranking based on the result of two previous championships. The most recent would have a 75% value and previous championship would be 25% value. Overall ranking would be in the category of male or female with the Senior Championship (based on previous 2 events) worth 80% and Junior 20%.